If I told anyone who knows me that I have a list of restaurants I want to go to, I don’t think they would be surprised. I actually have two – one for the fancy ones I’ll be able to afford after I’m not a broke college student and another for the places I can afford now. The second list is actually quite long because I spend so much time looking up food that every time I cross off one restaurant, I already have two more to replace it. The Boyfriend likes it though because every time we don’t know what to eat, we just look at the list and weigh our options. Lady M Boutique, located in the Upper East Side, is very high up on the Try-List, as I like to call it. Everyone has been raving about their mille cakes for so long that I felt like I had to try it. I have had their Green Tea Mille Cake after dinner at Gyu Kaku before but have not tried any of their other flavors yet. After several blotched attempts to pay them a visit, the Boyfriend and I finally made our way over after work one day. We were lucky because when we arrived there was only one table open. We were seated and then offered their savory menu filled with sandwiches, salads, coffees and teas. 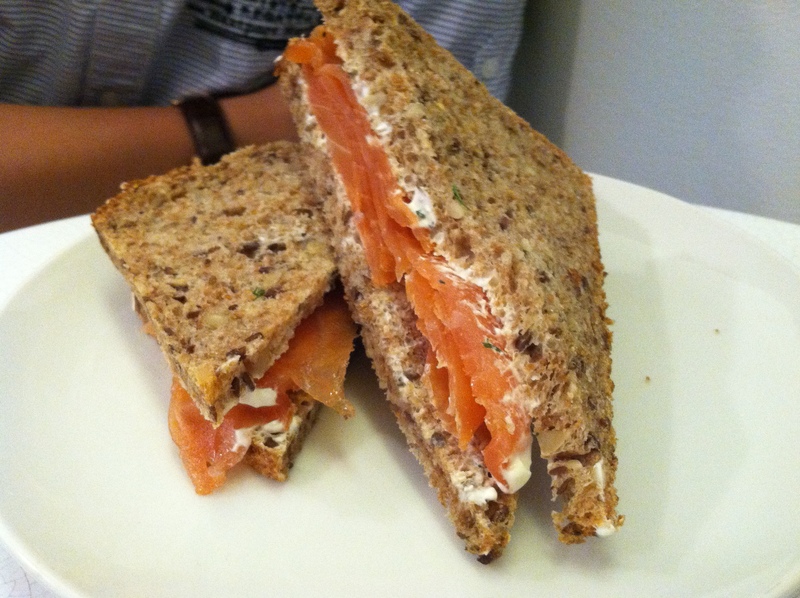 We decided to go with their Smoked Salmon Sandwich ($10.50), which features smoked salmon slices with a sour cream and cream cheese mixture as the spread. The sandwich was very good although a bit overpriced. I could probably get a bagel with lox at a local deli for a lot less. If you have the money to spend, go for it, but otherwise, it can be skipped. 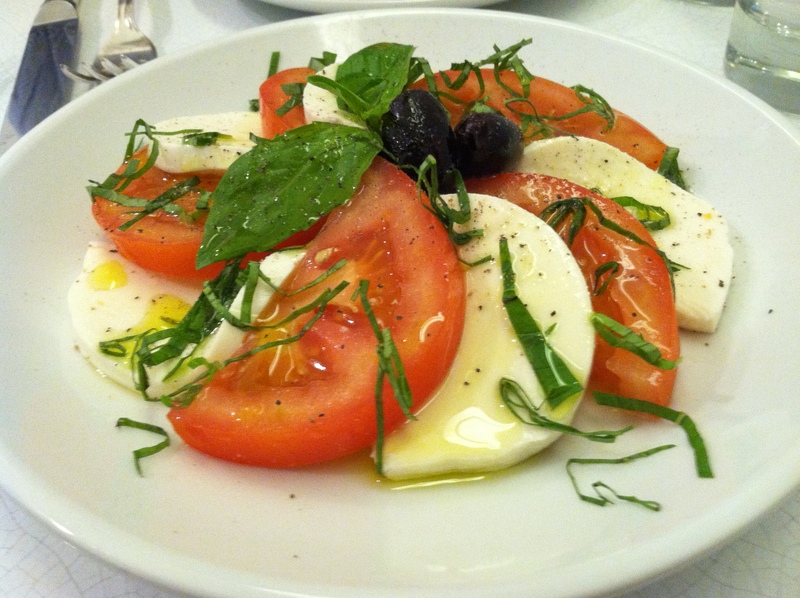 We also ordered a Caprese Salad ($12.00), which had about 5 wedges of tomatoes and mozzarella cheese. It was drizzled with a nice olive oil, which was good. They cut the mozzarella slices into the same size as the tomato wedges so it fit perfectly together. I’ve definitely had better caprese elsewhere, so I’d say this can be skipped as well. After my trip to Lady M Boutique, I’ve realized one thing – skip the savory and go straight for the sweet. After we finished our savory dishes, we ordered a piece of their Signature Mille Cake to share. Each slice will cost you around $8 but it’s definitely shareable. They don’t serve the Chocolate-Banana mille here, which was what I had wanted, but I’m definitely glad I went with the original. It was heaven! 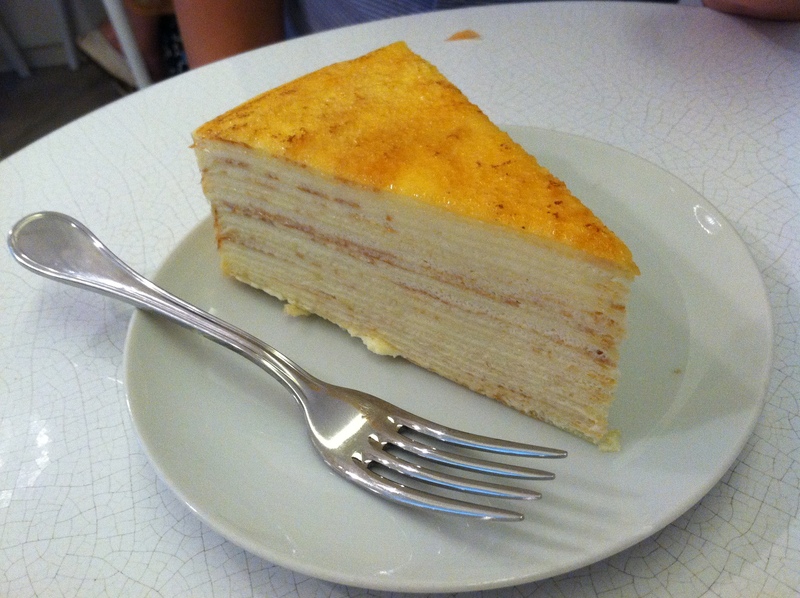 20 layers of thin crepes with creamy custard in between each layer, it was amazing! I’m pretty sure it was the best piece of cake I’ve ever had in my life. The crepes were very soft and the custard only added to the texture. It felt like I was eating a cloud – so light and so soft! 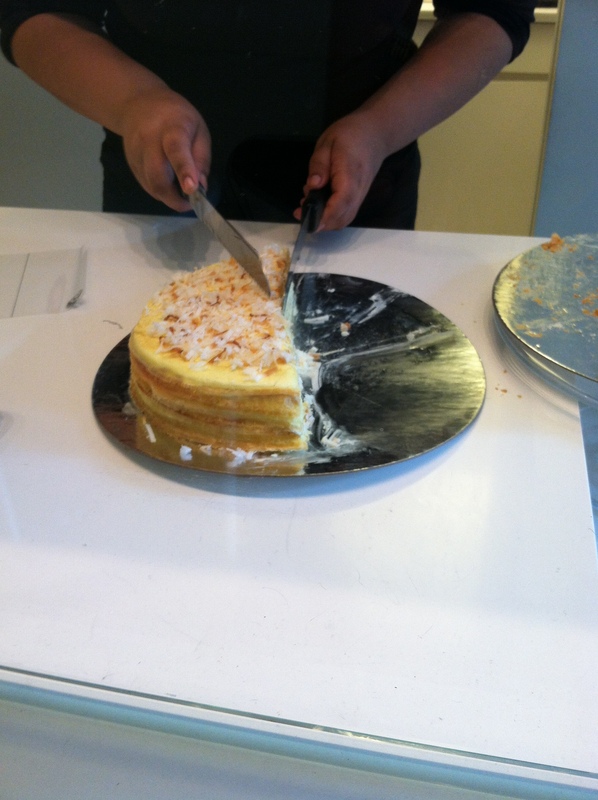 I also ordered their Coconut Mille Cake to go so I could try it at home. It doesn’t matter if you get one slice or two slices, they package it in a nice sturdy box for you. But a quick tip, definitely only get it if you’re going to be near a fridge soon because the custard does melt after a while. Despite the slight melting, the crepe cake still tasted amazing. I would love to make a visit to their secondary boutique in The Plaza Food Hall to try out their chocolate-banana mille. Our waiter told us that it was his least favorite, but I really want to see for myself. I don’t think anything can beat their Original Mille though. 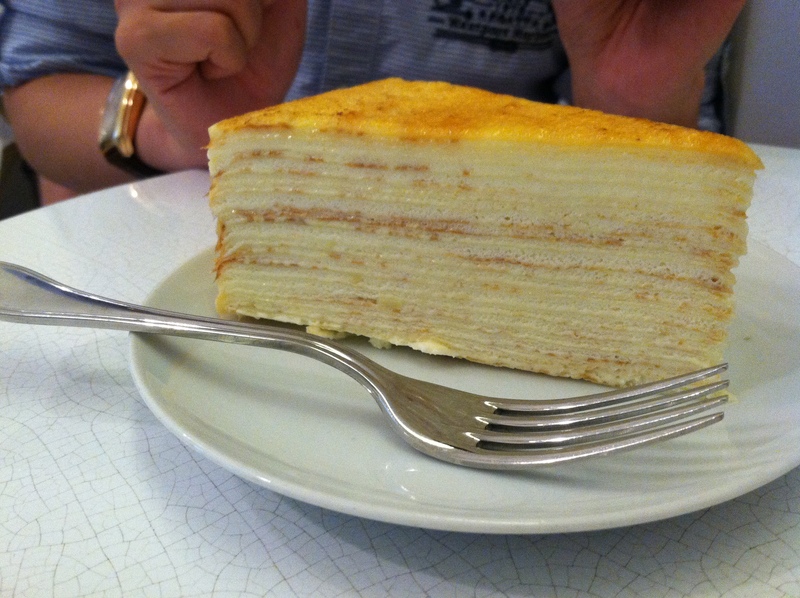 Even me, the green tea lover, would pick a slice of their classic mille cake over their green tea. Scenes from a countryside weekend with ❄️🌲 and the sloth. Today we climbed 41 flights of stairs and visited many temples and pyramids.